I am becoming a big fan of kale. It's so good for you and it can be quite yummy. One of my favorite ways to eat kale is as a chip. Yep - waaaaay healthier than a fried potato chip. Try this kale chip recipe for a great snack. 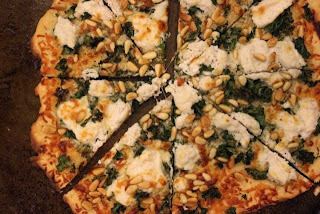 Or if you're looking for a quick dinner - go for this delicious kale, pine nut, and ricotta pizza. You can throw it together in no time! Prepare your dough on a pizza pan. I grease my pan, then spread the refrigerated dough evenly on the pan. I pre-bake my dough for 5 minutes at 400 degrees to make it a bit more crispy. In a small bowl, combine the ricotta and nutmeg. Drizzle the olive oil over the prepared crust. 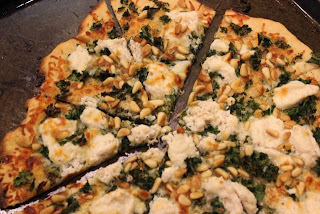 Sprinkle with shredded mozzarella, spread the bite-sized kale pieces evenly on the dough. Drop little dollops of the ricotta mixture on top and sprinkle with toasted pine nuts. Bake at 400 degrees for about 10 minutes, or until the cheese is starting to brown.